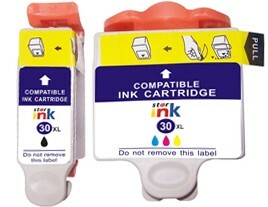 With our great selection of all genuine and fully compatible Kodak inks and cartridges, you can make fantastic savings on replacement printer ink. We are confident that we won’t be beaten on price when it comes to Genuine and Compatible Black and Colour Kodak 30XL/30XL Ink cartridges, so make us your go to destination for all your replacement needs. We also offer a completely free delivery service on all purchases, so you won’t be stung at the checkout with hidden costs and charges. Why not make a saving today, and check our bargain prices on Kodak 30 XL Multipack ink. A great offer is one click away.